There are many scenes in La dolce vita that get referenced over and over, including its bizarre ending and Anita Ekberg’s famous dance in the fountain. 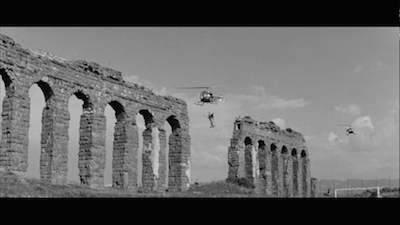 But there is none more indicative of the impact of Federico Fellini’s 1960 motion picture than its opening sequence: a helicopter flying a statue of Jesus high above Rome. Up in the whirlybird sits Marcello, as played by Marcello Mastroianni, a reporter who peddles gossip, a prince of the Italian nightlife. As bikini-clad women look up past the towering Christ, Marcello waves down at them and asks one for her phone number. Our hero has arrived. 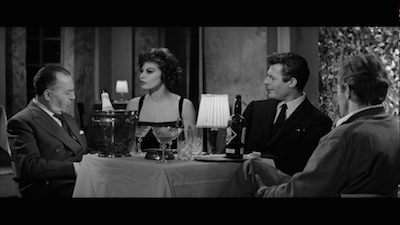 Grappling with La dolce vita for analysis is a daunting task. 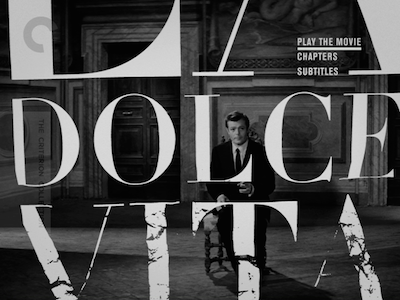 Fellini’s film has a large reputation, but you’ll find that when watching La dolce vita, the reputation is inadequate. The movie itself is larger still. It encompasses so much, yet does so with such clear storytelling and verve, one barely knows where to begin. Slicing off a piece to investigate feels trivial; La dolce vita is an uncarvable whole. It embraces and critiques modernity, celebrity culture, the nouveau riche, religion, business, art, ambition, and ennui. It is more vital more than half a century later than most films released today and set in the here and now. In fact, watching it in 2014 and considering how much Fellini’s Rome resembles a more sophisticated version of our own culture of decadence and scandal, it’s hard not to feel like we are all a bunch of rubes. 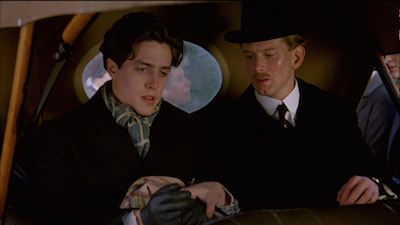 The Italians did it so much better, and so long ago, and wearing much better clothes. That the man being discussed is the perpetrator of a murder/suicide where he killed two small children before turning the gun on himself should tell you how deep and dark this fear goes. As Marcello had said earlier of his city, it’s a “peaceful jungle,” but it’s a jungle all the same. Wild and fun...until it’s not. Which isn’t to say La dolce vita is a dour affair. Even when the drunken fatigue sets in, it’s still buoyant and flashy. And, of course, before that, we are along for the ride, partaking of the spectacle right along with the charming rogue who serves as our guide. The first half of the movie is almost entirely on an upswing. 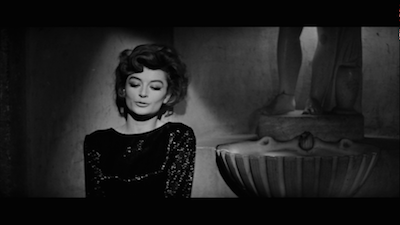 Marcello canoodles with the wealthy heiress Maddalena (Anouk Aimée, Lola [review]), he frolics with the Swedish actress who is turning everyone’s head (Ekberg), and he wends his way through nightclubs as if he owns the joints. Like Ray Liotta in GoodFellas , doors open for him. His only real trouble seems to be the tumultuous relationship with his fiancée Emma (Yvonne Furneaux, Repulsion [review]). Emma is a manipulative drunk, and Marcello’s philandering drives her to attempt suicide as a way of getting his attention. Yet, for as contemptible as that is, Emma is indicative of the sickness that is in the air. She is the consequence of this lifestyle of no commitment. 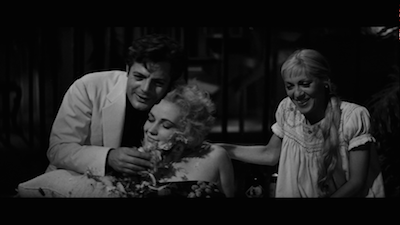 Marcello envisions setting down as a kind of deathtrap, and so he keeps the woman he is to marry at arm’s length, in much the same way he holds off his own talent. The Roman partiers are like swifts, the birds whose legs are too weak for them to land and ever take flight again. They must stay up high or come down for good. 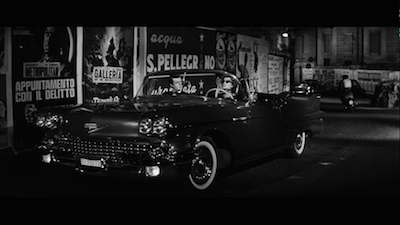 Fellini constructs La dolce vita almost like one would a musical. There are certain anecdotes he shares, and then he connects them with song-and-dance numbers. These all take place at the nightclub, and include clowns--one of the director’s passions (see his film I Clowns [review])--who offer a bit of commentary through their routines. Marcello sees himself reflected in the sad buffoon. He and his friends are like the comedic performer’s balloons, airy and insubstantial, following a pied piper to goodness knows where. I mentioned above that we can see our current culture reflected in La dolce vita. This is true be it in the grisly violence (in addition to the murder/suicide, there are references to domestic abuse) or the press’ obsession with the same. The scenes with Paparazzo (Walter Santesso) are so familiar, the legions of photographers that hound celebrities and public figures have taken their name from the character. 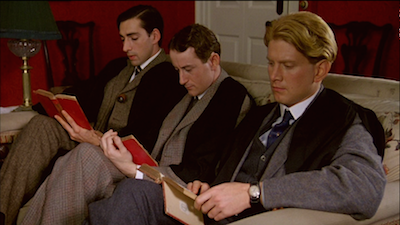 If there is any one character that we might be, however, whose shoes we might understand walking in, it’s Marcello’s father (Annibale Ninchi). He doesn’t live in Rome, and on a rare visit, he goes out with his son, partakes of his life, and finds it’s too much for him. Like us, he is the casual observer who can only become engorged on the experience rather than be a part of it. 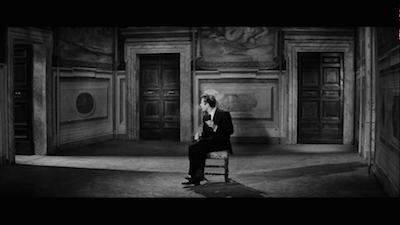 The contrast between Marcello and his father ties in with other generational divides that Fellini shows us. 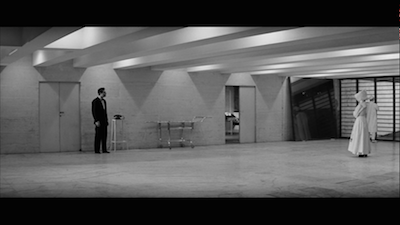 Not long after, Marcello is at a party in a castle (which he goes to with future Velvet Underground-singer Nico, who is playing herself) that has historical significance far beyond the way the man who is set to inherit it treats the estate. His mother and his father both chastise him, unable to understand how the younger Italians can be throwing away history with such ease. It’s also the site of La dolce vita’s most tender and saddest scene, when Marcello confesses his true feelings to Maddalena, only to lose her in the moment even more than he realizes, an unseen cuckold ridiculing his raw emotion. By that point, though, Marcello’s defenses are down, and his own nausea (as Sartre might call it) has begun to settle in. 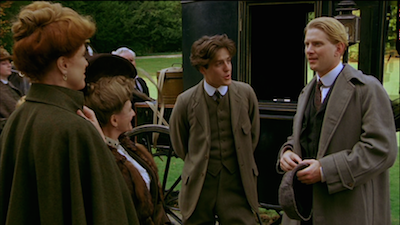 His father’s excess was contagious, and after tat particular outing, the fun slowly drains from Marcello’s life. Each successive soiree grows more somber, ending in the bad party to end all bad parties, Marcello engaging in a sad cabaret of his own to try to reignite the musical element and keep the festivities going. * It’s a lurid display, and mean-spirited, and mostly directed at his own disgust with himself. He can no longer deny the bitter irony of Maddalena’s words back when things between them were good: “It’s not so bad. So few of us unhappy people remain.” It’s the truth in opposite. It is that bad, and everyone is unhappy. 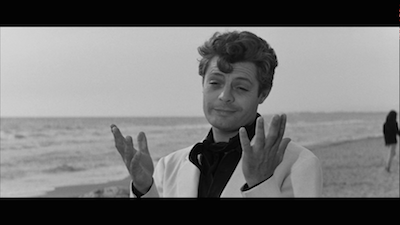 Which is why Marcello finds himself where he is at the end, staring at the bizarre sea creature that has been drug up on the beach, his friends unable to appreciate this monstrosity with the appropriate shock or grandeur. 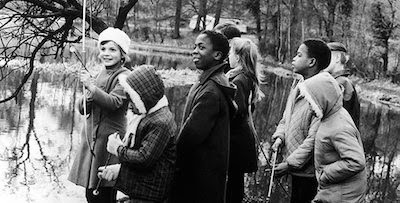 It’s a kind of call back to earlier, when the revelers were listening to a friend’s recordings of nature, and nonchalantly declaring, “Birds. That’s exactly how they sound.” They are so deep in their own false constructs, they no longer have any connection to the natural world except as something abstract that can be trapped and held in some way. As the movie closes, Marcello sits between the aquatic behemoth and a little girl who previously told him of her own modest ambition. He is caught between something unidentifiable and grotesque and something pure and hopeful, and Marcello can’t recognize either. So he just carries on with what he’s doing. Ever the master illusionist, Fellini presents all this as if it were a spontaneous happening, without any structure, as unpredictable as the behavior would appear. This is false, of course, that’s part of the trick. The mirrors and the wires must remain invisible. 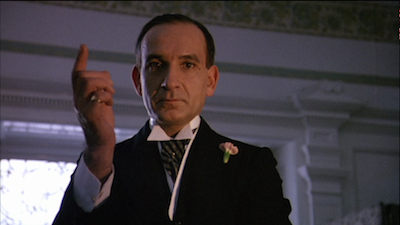 As a piece of Italian cinema, it’s an expansion of possibilities, a fully widescreen endeavor. There is a joke in the movie when someone asks Anita Ekberg if Italian Neorealism is dead. Her translator doesn’t bother to translate the question, he just quickly tells her to say it’s alive. 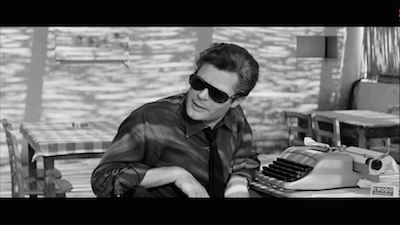 Fellini is, of course, being cheeky, because La dolce vita is moving beyond Neorealism into something more like hyperrealism, a style more appropriate to the changing times. Fitting, then, that Otello Martelli, who also shot such Neorealist classics as Paisan [review] and Stromboli [review], should be behind the camera for this one, allowing Fellini to keep one foot in tradition while remodeling cinema for the future. If you’ve been waiting to visit La dolce vita again, or have yet to partake at all, there is no better time than now. After years of inadequate DVDs, Criterion brings us a full restoration, shown in splendid high-definition, struck from a 4K master. The picture is marvelous, with a pristine surface image and just the right amount of grain to maintain the cinematic feel. 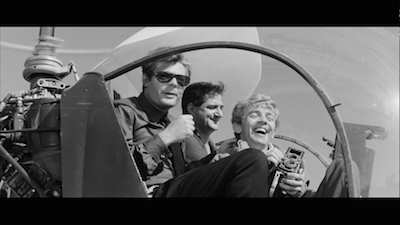 There are also a ton of extras celebrating La dolce vita, including a tour through one man’s collection of ephemera relating to the movie and interviews both new and old. * Does anyone else think of the scene in Mad Men where they are riding the lawn tractor at the office party when Marcello mounts the drunk farm girl? 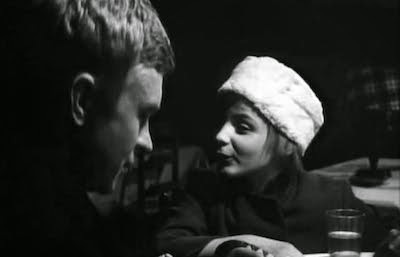 Serge Bourguignon's Sundays and Cybèle, a 1962 drama that went on to win the Best Foreign Language Oscar the following year, is a unique movie. 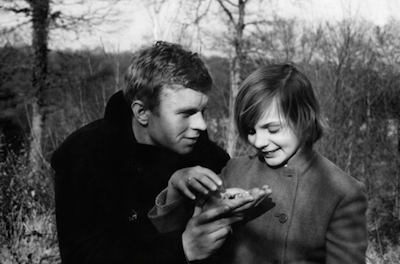 The only other film it brings to mind is René Clément's Forbidden Games, the tale of two young children living in hiding during World War II, only Sundays and Cybèle is set in peacetime and one of the children has been swapped out for an adult. Regardless, Clement’s remarkable film is excellent company to be in. Hardy Krüger stars in Sundays and Cybèle as Pierre, a traumatized soldier who has returned from combat with no recollection of who he is and a vague feeling he did something terrible to earn this affliction (we know more than he does, having seen some of what went down in a stylized, dream-like flashback). Pierre lives in a remote French town with Madeleine (Nicole Courcel), a nurse who fell in love with him while he was in the hospital. She gives him a place to stay and tries to encourage his recovery, letting him spend his days in convalescence. He kills some time working for a local artist (Daniel Ivernel), wanders around looking for clues to his identity and trying not to be waylaid by his chronic vertigo. Things change when Pierre meets Francoise (Patricia Gozzi) and her father at the train station one night while he’s waiting for Madeleine. The girl is being dropped off at a nunnery, and when Pierre finds out the father has no intention of returning to visit her, he decides to look after Francoise himself. The girl is allowed to leave the school every Sunday, and so she and the older men start meeting each week. Francoise’s mother is dead, so without this man posing as her dad, she'd have no one. She swears her love to Pierre and promises to marry him when she is eighteen. The one thing she won’t do, however, is tell him her real name. It’s a secret. The nuns have started calling her by a French name because they don’t like her birth name, which is Greek and has connotations that are not Christian. They rightly understand that names are power. The subject of an adult and a child finding kinship in itself is not controversial (consider, for instance, Claude Berri’s The Two of Us [review]), but Sundays and Cybèle walks a provocative line. It makes no bones about the closeness of the twelve-year-old girl and her troubled thirty-year-old companion. While the two never cross the line into anything sexual, there is a physical affection between them. They are essentially playacting. They are two orphans playing house. How their friendship is interpreted depends on how they are observed. The act of watching is what Bourguignon is inviting us to partake in, and he crafts Sundays and Cybèle's visual language to emphasize this. Pierre often appears encircled or framed by objects that draw our eye in his direction and isolate him simultaneously. At other times, he is observed from extreme vantage points, looking up or down. In one intriguing shot, we spy him from the side mirror of a passing vehicle. These images have the dual effect of encouraging us to consider a different way of viewing things, but also of containing him, as if bringing focus to his scattered thoughts. The shapes are often circular, reflecting Pierre's vertigo, but they are also an important clue to Pierre's past, repeating patterns buried in his subconscious. These things are indicative of the future, as well, the act of seeing through the circle intended to remind us of the crystal ball Francoise mentions belonging to her grandmother. When Pierre sees an actual fortuneteller mid-way through Sundays and Cybèle, she has little to say. Yet, he so believes in her powers, Pierre steals a magical dagger from her, believing it will provide access to another world. Bourguignon offers up various conflicting visions of Pierre. The man who doesn’t even know himself contains multitudes. In one scene, he is like St. Francis of Assisi, innocent and kind, with birds perched on his shoulder and head. Of course, it's also ironic that Pierre is standing in a giant cage that he has built around himself, and that he will soon step out of, leaving the birds behind. Later, Madeleine will realize her own predicament, that she has also built an emotional trap with herself at the center, while walking around the studio where that and other cages have been kept. In her moment of epiphany, she is flanked by one such cage, as well as its shadow, the image blurring behind her, appearing like double vision. Like the two different Pierres. Because for as benign and childlike as he can be, Pierre can also appear monstrous. 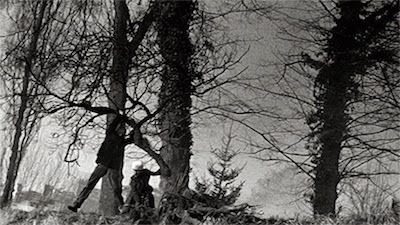 In some of the nature scenes--trees and water both frighten him, the stuff of dark fairy tales--I am reminded of Boris Karloff playing Frankenstein's Monster . Pierre is almost too brutish, too unaware, the girl must teach him how to behave, her purity standing in relief to his--though her own innocence is balanced by the mature trappings she adopts as self-preservation. The scenes are strikingly familiar. They throw things in the water, she plays dead and let's him carry her, etc. Consider this in direct contrast to the man on the horse that Francoise imagines as a kind of romantic hero, capable of the chivalry she'd push Pierre toward, but that we fear he is not equipped for. Even when he takes the sorcerer's dagger at the carnival, when he walks away with it concealed under his jacket, Bourguignon places a knight's armor in the background, in our eyeline if not Pierre’s. The knight doesn't readily have a sword, but if he did, its size and sharpness would surely put Pierre's illicit dagger to shame. Carrying on with this idea, Francoise abhors brutishness. She despises Pierre for hitting another child when he's jealous, and she is also frightened to see him in a drunken brawl, itself spurred on by his reacting with an open hand to a kiss from his ersatz girlfriend. The warrior frozen in the moment of his greatest shame and defeat can only react with force. Both Krüger and Gozzi are exceptional performers. The tricky thing about their roles is that the are basically swapped. Krüger is playing, for lack of a better description, a kind of dimwitted manchild, a beast who needs taming; on the other hand, Gozzi is a kid who has had to grow up too fast. Hers is the more delicate balancing act, because she must also maintain a certain naïveté. Francoise is still manipulative and selfish, the way a child would be, even as she invents adult scenarios for the two of them. The young actress actually looks like a middle-school version of Juliette Binoche, and frankly, shares some of the talent, as well. Her ability to be so emotionally open is incredible, while Krüger ends up being equally impressive for his restraint. The actor makes Pierre's hurt and confusion visible without pushing toward Of Mice And Men territory. His difficulties seem genuine, and not an impression. These differing points of view are meant to challenge our own perceptions of this relationship. 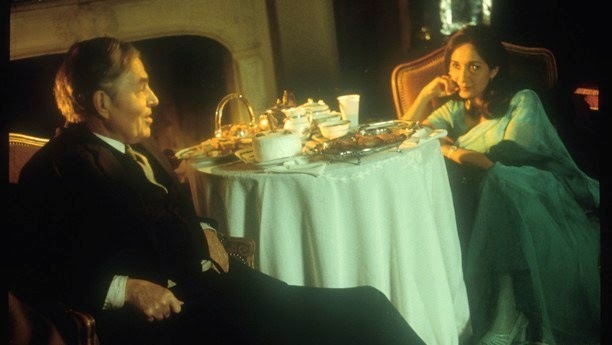 That's the daring thing of Sundays and Cybèle, that Bourguignon would dare to confront what is "normal" and suggest that maybe the more disgusting implications of the pairing only exists because the common folks project those possibilities onto it. Because, really, aren't these just two people who need one another? 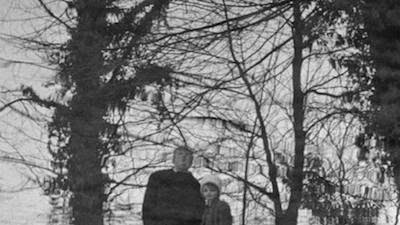 Their bonding method is unsettling in its way, but no moreso than the sad fact that it's a shame that the world has only given us more reasons to be suspicious in the years since Sundays and Cybèle was first released. The movie’s central difficulties aren't easy to dismiss, but then, neither are all the other possibilities the script raises. 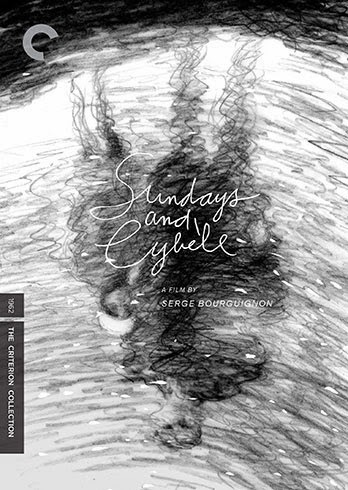 Nor can one ignore the honesty of the emotions on display, which is what makes Sundays and Cybèle so genuinely intriguing.